HIGHLIGHTS: Panther Creek is located in the Chattahoochee National Forest and runs for 3.5 miles from US 441 before reaching its namesake Panther Creek Falls after 3.5 miles. 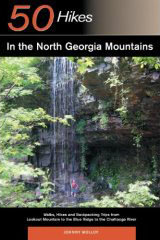 The 75 foot water fall is located in the Panther Creek Recreation Area which is a heavily used but offers well maintained trails and parking facilities. The hiking trail starts as an easy to moderate walk along Panther Creek. As the footpath closes in on the falls, however, it gets much more challenging and at times hugs stone cliffs that are lined with wire cable to prevent hikers from falling in the ravine. Most hikers can hike in and out in four hours but allow some extra time to enjoy the pool at the base of Panther Creek Falls which can be very refreshing in the summer months.